Texting service updates will increase revenue and customer satisfaction. It’s common for customers to leave their cars for service while they go about their daily lives. Texting can immediately notify a customer of the status of the work in progress and when their vehicle is ready for pickup. Better communication leads to improved customer satisfaction and loyalty. You can also close more sales for service work by attaching photos to a text to show proof and visually explain inspection findings for repair work that needs done, as well as allow the customer to text back their approval to proceed. Using texting to communicate not only saves you time by taking the place of phone calls, it allows your customers to make decisions and reply promptly. Scheduling text reminders will keep the appointment calendar booked. Reduce the number of no-shows and last-minute cancellations by confirming appointments with customers via text and enabling them to conveniently cancel appointments by replying directly to your message. Knowing about cancellations ahead of time means you can fill the open appointment with another service and eliminate down time. Real-time promotions will reward customers and keep them connected. Reward valued customers for their loyalty by texting real-time promotional offers and encourage them to keep regular maintenance appointments they may be avoiding by offering customized discounts. Do you want to take full advantage of texting to connect with your customers better and lift sales? 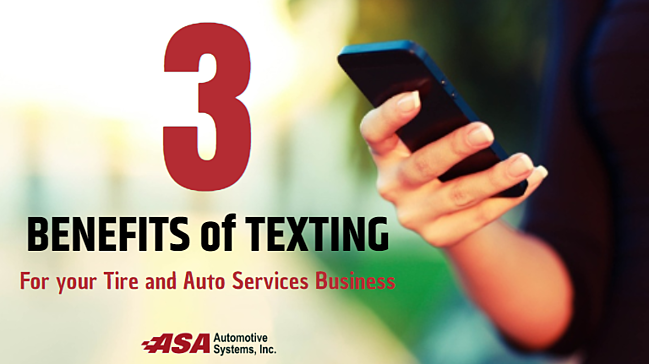 Download our Guide to Texting for your Tire and Auto Services Business to learn texting best practices and even more benefits of using text messaging to communicate with your customers. Already using texting for your business? Comment below how it has helped increase customer satisfaction! *According to studies performed by RingCentral, SinglePoint, Forbes and Harris 2016-2018.